Review: Dr. Caroline Caldwell (a scientist) and Miss Justineau (a teacher) are living in a dystopian future. They embark on a journey of survival with a special young girl named Melanie. Through the journey Melanie has to discover what she is and ultimately decide her own future and also that of the human race. I really enjoyed this film. I found it to be a really unusual and interesting film. This is based on a book “The Girl With All the Gifts” by M.R. Carey. This had a brilliant cast with the likes of Gemma Arterton and Paddy Considine. It did remind me of the film Never Let Me Go, 2010. This also reminded me to a certain extent of the Cornetto Trilogy starring Simon Pegg, because of the theme of zombies. 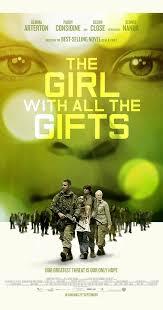 One thing I liked about The Girl With All the Gifts was right from the start you never knew what was going to happen. Each scene came as a surprise. There were so many scenes where I was literally off my seat because I was so worried about what was going to happen next. I also enjoyed the soundtrack to this film. Some of the shots were filmed in Birmingham and also Hanley, Stoke-on-Trent, Staffordshire, U.K. (the disused bus station which will be torn down in 2017/2018 to make way for a new shopping centre.) This is a very violent film throughout.